What Are the Types of Tubing Connections? Usually the standard in developing countries (e.g., all of Latin America). Has one large hole, which is air intake to drive the turbine to spin, and a small hole for water to cool the bur/tooth. No air exhaust, so the exhaust just blows right out of the handpiece, making it much louder. Also, no chip air, so the water comes out more as a stream than as a fine mist. A 2/4 adapter can be used to fit this kind of handpiece onto 4 hole tubing, but the handpiece will still not have the chip air or exhaust air features. Used very little. In fact, we may be one of the last manufacturers still to offer this style! Has the same handpiece thread design as 2 hole, but with the addition of one extra small tube for the chip air line to allow the water to come out as a fine mist. Can be converted to 2 hole by simply removing the chip air tube. The standard in the U.S. and Europe. 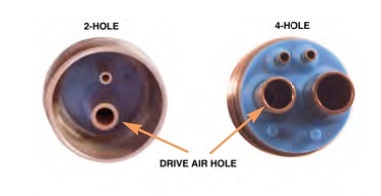 Has two large air holes (the smaller of the two is air in and the larger is air exhaust out). Also has two small holes, a water tube and a chip air tube (which brings air to the head where it either mixes with or hits the water to make a fine mist) to cool the bur/tooth and clear debris. A 4/2 adapter can be used to fit this kind of handpiece onto 2 hole tubing, but the handpiece will lose the exhaust and chip air feature. transmits light through the handpiece and illuminates the bur and tooth area for better visibility. Has all the other features of 4 hole as well. 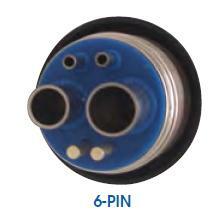 A 5 hole handpiece can be used on 4 hole tubing, but the light feature will not function. 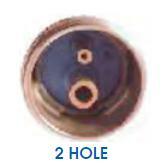 Couplers can be 2 hole, 4 hole, and fiber optic (2 types). 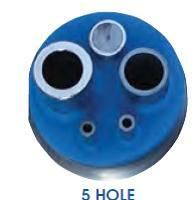 5 hole fiber optic couplers have an internal glass rod that goes onto tubing that has a light source (bulb) either in the tubing or on the dental control unit. 6 pin couplers (with 4 holes like a normal 4 hole handpiece plus 2 metal pins to provide electricity) have the light bulb in the coupler itself.